Laura Perille, the newly-appointed interim superintendent of the Boston Public Schools. Laura Perille, the newly appointed interim superintendent of the Boston Public Schools, has what many educators consider to be a highly unorthodox resume for the leader of a major urban system: She has never worked as a teacher, a principal, or a high-ranking school official, and she doesn’t hold a state license to run a school system. Perille also doesn’t have an advanced degree, infuriating some educators who have earned masters or doctorates in a quest to better serve their students or gain a leadership position. But educators who have worked with Perille at EdVestors, a small Boston education nonprofit where she was chief executive, say her nearly two-decade quest to help improve the school system has provided her with insight into what works and doesn’t work and a strong understanding of how competing interests across the city can aid or undermine policy initiatives. They praise her emphasis on collaboration, her laser focus on data, and her nonjudgmental way of helping people challenge their thinking and identify solutions. And as the mother of two Boston public high school graduates, Perille also keeps family engagement at the forefront of her thinking, they said. Perille replaces Tommy Chang, after he and Mayor Martin J. Walsh decided to part ways last month following a series of public controversies, including an ill-fated proposal to change school start times. Walsh and the School Committee, which unanimously approved her appointment on July 2, have tasked Perille with rebuilding trust between the department headquarters, individual schools, and the broader community. They’ve also charged her with overhauling the notoriously dysfunctional central offices, which are often viewed as too focused on compliance rather than on fostering improvement. Perille, who will receive a $250,000 annual salary, will also oversee teacher contract negotiations. It’s unclear whether she will seek the job permanently. A search for a permanent superintendent could take a year. In a school system that typically looks within for interim superintendents, Perille’s selection came out of left field for many Bostonians. Walsh and School Committee chairman Michael Loconoto have said in a statement that she has “the drive, skills, and expertise” to push the system forward. But some educators and public school advocates, including the NAACP, question her ability to effectively lead a system of 56,000 students, 124 schools, 600 buses, and more than 10,000 employees, given that she oversaw fewer than two dozen staffers at EdVestors and is not a trained educator. Some detractors voiced their concerns to the School Committee at the July 2 meeting. A few said it was hypocritical to hire a white woman without the proper credentials when the school system has let go or refused to hire teachers of color who don’t have the appropriate certification. “Please do what’s right for this district — and this is not what is right and you all know this is not what is right,” said Barbara Fields, a retired Boston school administrator who worked on efforts to diversify the teaching force. Perille, described by many who know her as even-keeled, has taken the criticism about her background in stride. Perille has already been reporting to school department headquarters, where she held a meeting with more than 200 staffers three days before the School Committee officially appointed her. She also visited the Mildred Avenue K-8 School in Mattapan July 9 to kick off summer learning. In the coming weeks, she plans to meet with principals to gain a sense of how the central offices can better support them. Several school leaders said they are excited to work with her. While Jessica Tang, president of the Boston Teachers Union, said Perille’s background makes her an unusual pick, she is encouraged by her work in expanding the arts and her emphasis on teacher collaboration. “I do think she understands the importance of learning from educators about best practices and empowering teachers,” Tang said. 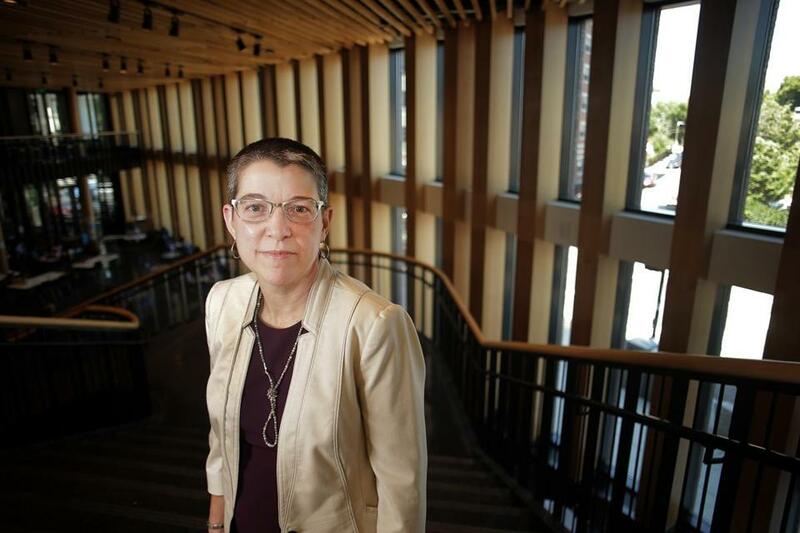 Perille, 52, moved to Boston in 1987 after earning a bachelor of arts from Brown University. She and her husband, John Riordan, director of community relations and partnerships at Boston Children’s Hospital and one-time chief of staff for former mayor Raymond Flynn, raised two children in Jamaica Plain and enrolled them in the Hernandez K-8 School in Roxbury, where students learn in both English and Spanish. At EdVestors, Perille had a unique window into the school system. For the past 12 years, the organization has honored a Boston Public School that has demonstrated significant gains in student achievement with a $100,000 School on the Move Prize. Early on, the organization detected a pattern among prize winners: The schools valued teacher collaboration and leadership as well as family engagement. Last fall’s winner provides insight into how Perille might pursue school overhauls. She applauded the Mildred Avenue K-8 School for having a joint labor-management committee to oversee the school. The structure gave teachers more say in key decisions, including the hiring of a principal, a key ingredient in the school’s success, she said. She implored school district leaders to utilize the strategy at other schools. More broadly, Perille oversaw the raising of millions of dollars that helped the school system double the percentage of high school students receiving arts instruction to 68 percent between 2009 and 2017, while the percentage of students in prekindergarten through Grade 8 receiving weekly arts instruction has risen from 67 percent to 95 percent. A newer effort, launched in 2015, replaced a push to bring Algebra I to the eighth grade with a more expansive approach to improving math instruction at multiple grade levels in 16 city-run schools and charters, reaching about 4,000 students. The initiative aims to address a disturbing performance record: Two-thirds of the school system’s eighth-graders are not proficient in math. Wendell Knox, chairman of EdVestors’ board, said it was bittersweet that Perille is leaving the nonprofit.